Your Search Ends Here! Wonderful Mid-Century Cabin Backing Up To Beautiful Forest Land At The End Of A Quiet Cul-De-Sac. Distinctly Designed With Points Of Interest Throughout Just Waiting For You To Add Your Personal Touch! Lots Of Parking In Front With Gently Spaced Stairs Leading You To The First Deck And Entry. The Main Level Features The Living Room With Soaring Open Beam Ceiling, A Wall Of Glass And A Brick Fireplace, The Kitchen With A Roomy Breakfast Bar, Dining Area, 2 Bedrooms, Laundry Area And Full Bath. From This Level There Is A Sliding Glass Door To The Front Deck To Enjoy Your Morning Coffee And Savor The Lovely Tree Views. Upstairs Is A Large Loft Bedroom With Adjoining Bath Featuring A Walk-In Shower. 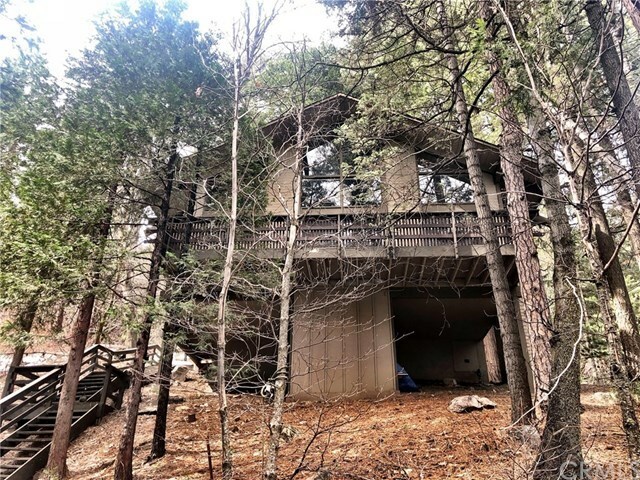 This Treasure Is Located In Twin Peaks, Just Minutes Away From Lake Arrowhead Village, Shops, Dining And The Lake. To See It Is To Love It! Directions: From Hwy 18, Use Daley Canyon Rd, Left On Hwy 189, Left On Fernrock Rd, Left On Willow Springs Dr.